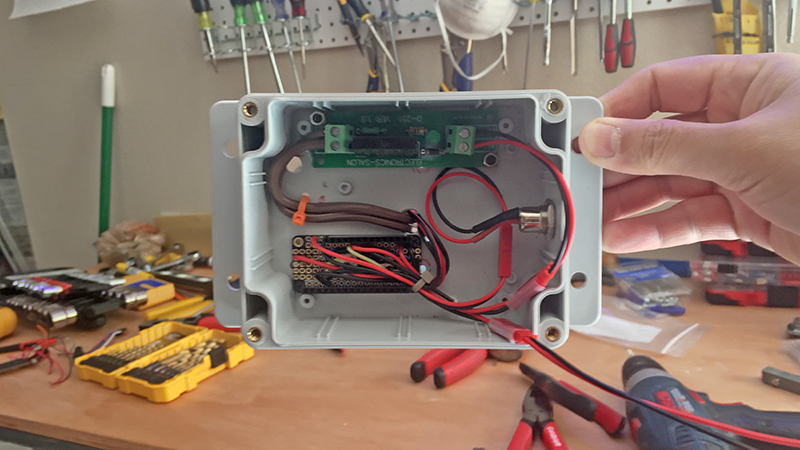 Here is my Garage Door Opener project. Yeap! Another Garage Door project. What the heck! I am attaching a manual sketch that I drew very quick so anyone can have an idea what I am talking about, plus some pics, and of course, my code. The sketch looks simple and so does the code, what is time consuming is the debugging process, testing, etc. GPIO 4 is the input(configure using the INPUT_PULLUP, so no external resistor needed. The internal resistor of the ESP8266 works very well) for a magnetic switch attached to garage door, when the door is open or close, Blynk notifies me, basically that is the only purpose of this switch, but very important to know if the door is open or close. More than once I’ve left the door open for so long, once was the whole night. No good. GPIO 5 is the input(Same concept here, INPUTL_PULLUP is in action) of the magnetic switch that monitor but also commands to turn ON and OFF the lights in the attic. Blynk notifies me by email is this door has been opened. In my case, this is important . 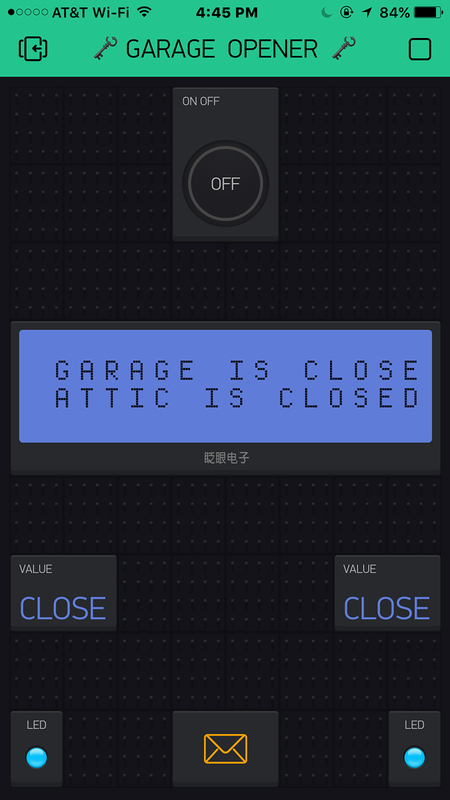 GPIO 12 is the output that opens and closes the garage door. 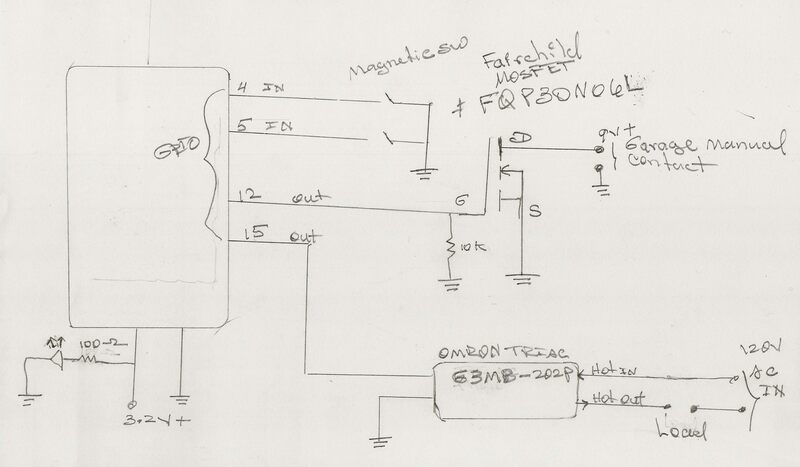 This pin is connected to a Fairchild MOSFET part number: FQP30N06L, when the Widget Button is pressed using virtual pin # 7, the MOSFET closes the circuit, so the door is open or close. Basically the MOSFET simulate the manual switch, actually the MOSFET Gate and Ground is connected in parallel with the manual sw. What is nice about this is that I can open the garage door two blocks away before I reach home, I love it! The 10K ohms resistor pulls the MOSFET gate to ground, so no false opening or closing if the main power goes off. 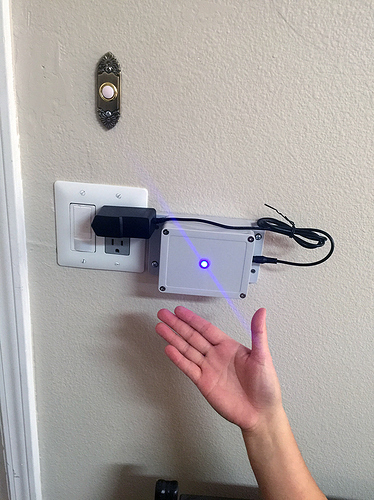 GPIO 15 is the output that turns ON and OFF the Attic’s lights when the door is open or close. This pin is connected to an OMRON TRIAC part # G3MB-202P. This TRIAC is 3.2V friendly. 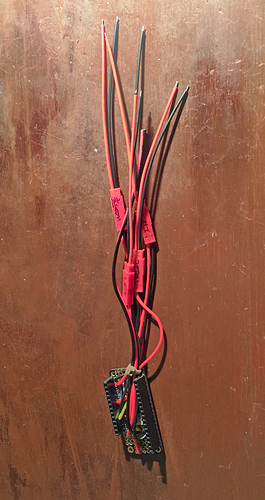 Pay attention to the HOT IN and HOT OUT, the load is connected between the HOT OUT and the Neutral wire of the 120V AC. This TRIAC don’t handle too much power, in my case is just about right. An LED connected to +3.2V using a 100 ohms resistor tells me if the power is up. 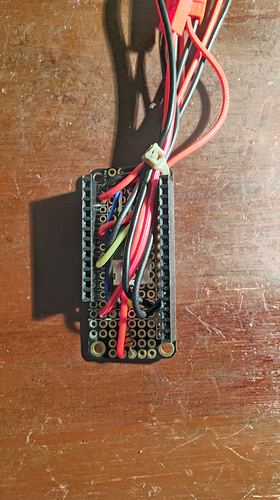 Finally, I used the Adafruit Feather HUZZAH with ESP8266 plus FeatherWing Prototyping Add-on . lcd.print(1, 0, "GARAGE IS CLOSED"); // LCD print, column 1, row 0. The Adafruit Feather HUZZAH with ESP8266 is not shown here. Basically, all the wiring is done using the Prototyping Add-on, so if the ESP8266 needs to be reprogrammed, just pull it out very easy. There you have it. All wires routed through the wall for a clean installation. Congrats with great project, event it is garage opener . Could you please use “Preformatted text” icon so your code was more readable? Thanks. I tried to use the pre-formated text, but I cannot get it working. If I correct, I place the text between this: </>, correct? I know the code will look way much better. @ITAlex I see you are using Blynk.run 3 times in a loop. Why is that? I think you may remove 2 of 3 without any problems. Also I see you are constantly sending data in loop to server. I wonder how it is working… Usually such code causes Flood error. Thanks for the advice, Dmitriy, I need to check the code later this week, the original code has only one Blynk.run(); inside the loop, we just added a yield(); inside the loop. It seems to be working fine. You guys are so great, on top of providing Blynk which there nothing close to it out there, you guys also provide tips and tricks how to improve our codes. Great job! I think the more garage door openers - the better! Thanks for posting such a detailed description! Blynk notifies me by email is this door has been opened. In my case, this is important . if it is that important, are you sure you trust email? in your hardware - it is hard to tell, but where are your fuses? Agree with you, the more “garage door openers” , well more ideas I hope. You know, Blynk is fun, creatives, encourages me to do things. When I saw the first time that I can control the famous “hello world” or blink(an LED) Blynk…using my iPhone, bingo! The light turned on in my head, and some ideas came to my mind. I have said it before, there is nothing out there compare to Blynk. You guys have done such a great job that whenever you guys decided to charge some amount, I am ready to support Blynk. Thanks for the tip about tweet. I’ll check it out. mmmmm I guess I trust the email now. I forgot to mentioned about the fuse, and you have a valid question. The fuse is located inside the board that contains the TRIAC,is a tiny in-line little fuse. That is why I mention to pay attention to the HOT IN because you connect the HOT IN to the input where this fuse is located, the HOT OUT is after the fuse, is something goes wrong after the fuse, hopefully, it will open the circuit intermediately. Here is a drawing of the TRIAC I am using. The A/B do not make too much sense to me. B should be labeled Hot IN, that is where the fuse is located, and A the Hot OUT, but they should be reversed. Thank you, Dmitriy, for formatting the code for me. I have the new code that I want to post, but… How do I format it? I click the </> , and it says hit 4 spaces then paste the code? Just select your code and press </>. and in the plastic box, it looks very professional, good work! Thank you, Gustavo. My pleasure to share ideas. I want to make a RC car with Raspberry pi 2 i don't know Java Script but know Python (not professional in Python, only enough to blink a led) There are many tutorial for Arduino and ESP8266 but is there any full tutorial about how to use Blynk (mainly Virtual Pins for pi)? i want to use Joystick to control my car with l293d ic. Please help if possible. I have 2 ESPs, one controlling the gate and the other with a magnetic switch to tell me whether the gate is open or closed. It works fine when I am at home connected to wifi or when I am outside connected to 3g. However, when I activate close gate and drive off, even though the gate closes, the LCD still shows gate is open. I think this is due to the transition from wifi to 3g and somehow, the LCD did not update the status. If I close the app and open the app, it will show the gate as closed. Is there something I can do to ensure the LCD gets updated correctly? Thanks. // Blynk app LCD widget whether the Gate is open or close. int sensorValue = digitalRead(sensorPin);  // read the sensor pin and assign sensorValue to it. int led4value = digitalRead (ledPin4);  // note digitalRead used although this is output pin. int led5value = digitalRead (ledPin5);  // note digitalRead used although this is output pin. Anyone with garage door opener facing this problem? Developers, is there a line I can add in the code to refresh the app to solve this problem? Did you find the Blynk.syncAll code?